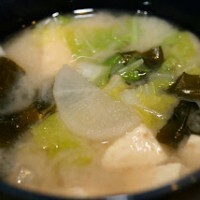 Place onion and then daikon in layers in a soup pot. Add enough of the four cups of water to cover the vegetables. Cover pot and cook vegetables until tender. Remove lid and add the remaining four cups water. 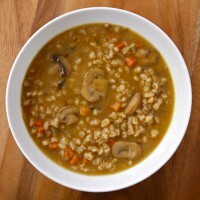 Dip out a little soup stock into a bowl and mix in the barley miso until the miso is dissolved. Add the wakame pieces and the soaking water. Cook over low heat for 3 to 5 minutes. Add the dissolved miso paste and shut off heat. Soak the barley overnight in 2 cups of water. Pour the barley along with the soaking water into a soup pot. Add two cups of fresh water plus the kombu. Bring almost to a boil, reduce flame and cook for 45 minutes. shiitake and sauté for another 3 minutes, then add the celery and continue to sauté for 2 more minutes. Finally, add the carrots and sauté 2 minutes. Combine the sautéed vegetables with soup and simmer for another 15 minutes. Season with miso to taste. Serve with a chopped garnish such as scallions, parsley, or watercress. 1. Trim corn from cob. Scrape cob with the back of knife to remove pulp. 3. 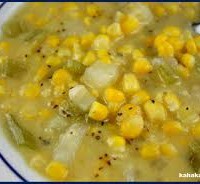 Place onion and corn cobs in a soup pot. 4. Add enough of the water to cover. 5. Add salt and bring to a boil. 6. Reduce heat and simmer covered until onions are completely soft. 7. Add corn and remaining water. 8. Return to a boil and cook an additional 10 minutes. 9. Dilute kuzu in a little water and add to soup pot. Cook until kuzu turns clear. 10. Serve garnished with a little finely chopped parsley.